A girlfriend suggested I write this book and I mentioned it in passing to an agent who said “Tessa, if you write that book, I will agent it!” Next thing we knew, Random House-Vermilion Press wanted it! Yikes! So I did! It wasn’t easy to write – that was one of my hardest years ever in terms of the rest of my life! – but there were times when I felt I was channeling the words. In fact, when I have fallen off the confidence wagon (which is often) I have many times been counseled by friends, “There’s this really great book you should read! 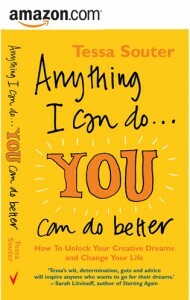 It’s called Anything I Can Do You Can Do Better!” And there are things in this book that I haven’t found anywhere else. It deals with money, relationships, artistic process, how to get started, how to keep going, agents and managers, family, and more. There’s even an entire chapter on jealousy. I tapped the minds of many successful and struggling artists for their best advice so that YOU, dear reader, needn’t make some of the mistakes I have made (they’re in there too!) Some very dear friends, who I have known for many years, and who give away their secrets within its pages, have “made it” since the book was published (may we all be so fortunate!) – including the inspiring examples of actor Graham McTavish, who some of you may now know as Dougal in the successful (and amazing) Starz Channel TV series Outlander and the Saint of Killers in Preacher; Renee Knight, author of bestseller Disclaimer, multi award-winning author, the late, Mal Peet, best selling author and historian Alex Kershaw and best selling novelist Veronica Henry whose romance novels are like getting into bed with a hot toddy and a fluffy hot water bottle when it’s cold and wet outside. I hope you find it useful. “This is absolutely not the standard ‘rose-tinted spectacles’ personal development book. But she doesn’t just tell you how she did it, but also tells how you can do ‘it’ too – whatever your own personal ‘it’ is.” Mark Forster, author of Do It Tomorrow, The Secrets of Productive People and How To Make Your Dreams Come True.